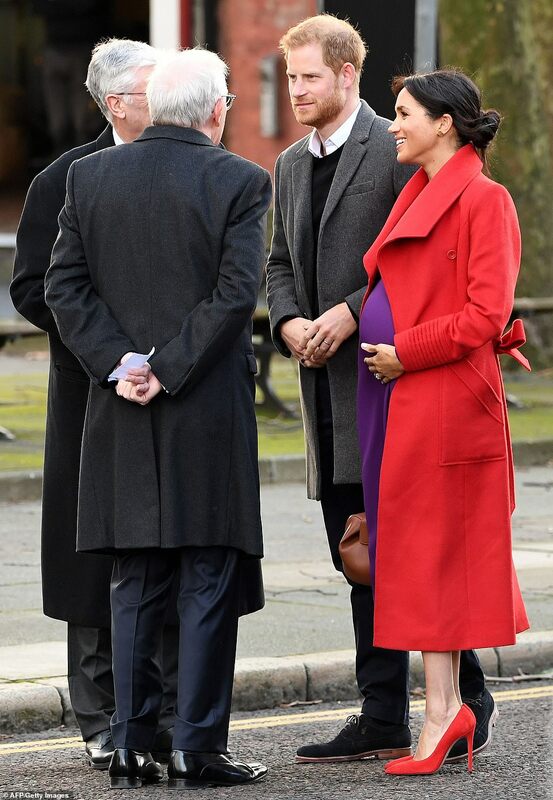 The Duchess of Sussex in Birkenhead, wearing red and royal purple! Some living color and bright pop for a change. Another pulled-back hairstyle which Meghan has been wearing recently, especially for her last several public outings. There was a FABULOUS documentary aired on our Channel 5 here on Saturday night about Wallis Simpson. Totally changed my opinion of her, a must watch if you can get it. Bet Meghan was there binge watching with the Ben and Jerry’s! There was a series of articles that ran several years ago that detailed some of her letters between Wallis and her ex Husband and it was clear she cared for him deeply and that she ended up being caught up in a situation that spiralled out of control. Edward VIII was a weak, spoiled man who always got his way and was beyond infatuated with Wallis. He clearly applied emotional blackmail to her in the end and knew she could never leave him as he had given up so much for her and made her very aware of that. She must have felt so trapped in the end and I understand why she became a recluse after he dies. Unfortunately she became the scapegoat when Edward was the one who was the person to caused the entire mess in the first place. I will try to catch up on the show as I feel she doesn't deserve the hate some.still throw at her. I've read books and I've seen a number of documentaries on Edward and Wallis. There's a lot of details and new information that was not known, or was purposely kept quiet, which often happens historically, particularly when women are involved. I don't know if you are referring to a new documentary @SHARPIE since you didn't provide the title. ITA there's plenty of evidence that's been revealed indicating Wallis was not really set on becoming Queen of England. From what I've read, Wallis most likely wished to retain power over Edward (aka David) via remaining his mistress, not his Queen Consort. It's also been suggested that Wallis didn't necessarily want to divorce her second husband either, since they had an understanding. All that changed when her affair with Edward was made public. With the eventual abdication, Wallis essentially became trapped in an existence she had not anticipated. It was much better for her to hold power and influence over a King of England, rather than babysitting a sad, errant and wayward duke for the rest of his life. That's not to suggest Edward, Duke of Windsor hadn't made his mark as a very stylish and popular Prince of Wales in his youth. But he was not cut out to be a leader of the British people. I'm sure Wallis had a modicum of affection for Edward, but he was the one who was held in thrall by her. She played her hand too well when she first maneuvered her way into becoming Edward's mistress, essentially stealing him from his former mistress, Thelma Furness. There are a lot of parts to the story, including the very misbegotten relationship between Edward and Hitler (with film footage of Edward and Wallis meeting with Hitler in Germany). Edward's suspected collusion with Hitler is a big reason why he was not allowed to return home to live in England. It goes much deeper than that, if you read the book, Princes at War, by Deborah Cadbury. In fact, before his death, King George V was very worried about his eldest son becoming King. Even though Albert/Bertie the second son (later King George VI) had his problems with stuttering and fragile health, he at least had the staunch character (and strong support of his wife, Elizabeth Bowes-Lyon) which enabled him to become a decent and a good-hearted leader, particularly during WW II (albeit the stress took a toll on his weak constitution, as did his incessant cigarette-smoking). Edward VIII's insistence upon marrying Wallis Simpson was likely greeted in certain quarters with some small measure of relief, as it forced the hand of the government to place pressure on Edward to either give up marrying Wallis or to abdicate. On the surface, abdication was certainly not a good thng, but OTOH it allowed Prince Albert to become King George VI (likely protecting not only the British monarchy, but also the British people and the trajectory of WWII, on a number of levels). Is there a way for me to find/see this? Fans of Princess Charlotte will love this gallery. … Bet Meghan was there binge watching with the Ben and Jerry’s! I realize you are only commenting in fun-spirited good humor, so please bear with me. I'm sure the British royals have fun watching television, but perhaps they more-so tend to enjoy comedies or various other genres, not necessarily associated with watching a documentary about a long-departed, and somewhat disgraced relative and his wife. Probably, the Sussexes unwind whenever they can by sometimes watching the telly. Of course, laughter is the best medicine, and some of the younger royals may indeed engage in a few guffaws and a bit of head-shaking over the more errant dramatic licenses taken in Netflix's The Crown. Right now though, DoS Meghan may not have much time for television watching. As a former actor, she's already ticked the box on a successful career in television, and her life has subsequently moved on to a very different plane and sphere of influence. The Duchess of Sussex is a member of the British royal family and thus by now she surely knows more than we can imagine about the inner workings of the family, possibly including family secrets dating back some years that have never been revealed to the public-at-large, nor to documentary filmmakers. DoS Meghan is six months pregnant and she's a very busy lady, planning for her first baby's arrival, not to mention other royal duties and upcoming public appearances on behalf of the firm. Of the rich British royal family history, I doubt DoS Meghan necessarily has avid interest in Wallis Simpson, regardless of the tabloids attempting to join them at the hip. I think DoS Meghan has more in common with European royal contemporaries like Princess Angela of Liechtenstein and Princess Charlene of Monaco, et al (and if historical antecedents are needed, Princess Grace of Monaco comes to mind). Wallis Simpson may have been a divorcee and an American with fashionable style, but I'd say that's where the comparisons with DoS Meghan fairly much end. In all significant respects, the two incidences of Americans marrying into the British royal family are completely different. In fact, I believe the modern-day love story and royal wedding of Harry & Meghan in some ways marks a healing of the decades of star-crossed love and personal anguish that the Edward & Wallis episode in British royal history, precipitated. The British royal family may wish to recall fonder memories of Edward VIII, or to largely turn the page of that painful period altogether. I personally wish there were more documentaries and dramas produced on the life of Prince William of Gloucester (the current Duke of Cambridge is his namesake). William of Gloucester became one of the lesser-known casualties of the Simpson affair/ abdication crisis. The British royals haven't been too interested in publicly remembering or revisiting the handsome and accomplished William of Gloucester's needlessly tragic life story either. Also likely because, for different reasons, it's probably too painful for the surviving elders who knew him. There's an old saying: you make your bed, you lie in it. She's the one who chose to have an affair with him in the 1st place. I'm not saying she deserved to be miserable all her life but no one else made those choices for her. As she loses those chubby cheeks she looks less & less like QEII & more adorable all the time. Its on Amazon Prime if you have an account as I streamed it from there a few weeks ago--Wallis Simpson, the Secret Letters. It was indeed an eye opener that she was still very much attached emotionally to Ernest Simpson but couldn't find a way out of the mess she had made of her life. And by then Ernest had moved on and wanted a life with someone else. It's on You Tube, as well. I would love to have her jacket! OMG, that evening gown (scroll down the page). Adds on at least 10 pounds! Well as she wore it in January last year she was approx. 5 to 6 months pregnant. I don't think the documentary that Sharpie referenced and I watched was the one you watched as there were actors playing Wallis and Edward and it wasn't Elizabeth McGovern. Also the secret letters were referenced but not discussed in much detail - though I think they had an impact on how Wallis was represented in this documentary. I read the letters a few years back when they were released and they gave a different perspective of Wallis and what she was going through that many had not seen before. Yes Wallis was having an affair with Edward so was certainly playing with fire but she never thought he would want to marry her and thrust her into a position that she had no control over - he became obsessed and in a sense bullied her into marrying him. It certainly wasn't the love story so many felt it was but I suppose they had to make the best of it in the end. She had an interesting life but I don't think it was particularly fulfilling once she married Edward - yes she wanted for nothing on a material level but she was very intellectual and Edward really wasn't. But at least Edward never ruled - he really wouldn't have made a good King. The UK got the better of that deal!! Okay, maybe that was it. I looked at the picture again and can see that she was pregnant - didn't notice it the first time, probably because I was distracted by the loud (IMO) pattern on the dress. Well yes - it certainly wasn't one of Kate's better choices. Comments are quite interesting and very level headed. I especially like that someone pointed out that Kate was gardening and making pizza early in the week. I also like the comment that they are two different women, raised in completely different circumstances, with different futures, different expectation, different jobs, and different husbands. It would be more surprising if they actually ended up best friends rather than just sisters-in-law who like and respect each other. I wouldn't really have expected Duchess Kate and Duchess Meghan to become 'best friends' either, as they both already have their own set of best friends, well-established with whom they are extremely close. The main bottom line is that they both have different personalities, but there are some significant similarities they share as well (dark eyes, dark hair, well-educated, fashionably stylish, intelligent, savvy, mother/mother-to-be of royal children, same ages with Meghan being 5 months older than Kate, good senses of humor, etc). So, sometimes the 'different' emphasis is overstated. It's not like they come from different planets. They are both married to sons of the Prince of Wales, and since there are only two such men in the world, Meghan and Kate share something unique that will likely eventually bring them both a bit closer over the course of their lifetimes. But yeah, there's really no need nor likelihood of them being best friends. I think they are both married to their number one best friends. "Capricorn's pessimism drives Leo to distraction, while Leo's egoism tries Capricorn’s patience." In the Jezebel article, I'm not sure what point is trying to be made juxtaposing those pics of the separate outings Kate and Meghan each attended today. They are both looking comfortable in their own skin. On another given day, Kate could be wearing pants and roughing it with young children on a nature walk, while Meghan visits an exhibit at the Victoria & Albert museum. The Mayhew animal charity is one of Meghan's new patronages, and it's a worthwhile organization, reflecting Meghan's passion and caring for animals. Another of Meghan's patronages is the National Theatre, passed to her by HM the Queen. That's a very prestigious institution and a huge deal for the Queen to have handed it over to Meghan. It wasn't given to Meghan simply because of her background as an actor either. Much of the negativity in the rampant tabloids is likely exaggerated, although the young royals are clearly experiencing growing pains (and likely some lower level palace leaks) as they all adjust to the changing family dynamic. Prince Harry is no longer the third wheel accompanying Kate and William to events. Kate was especially close to Harry as a sister-in-law, but their connection has changed slightly, just as the closeness between Meghan and her pre-Harry male confidante, Markus Anderson, has necessarily readjusted. Gorgeous shade of navy with Harry in matching deep navy suit. The sequins are so shiny and Meghan has such a large bump (it surely has grown bigger in just a few days) that the photos are not very flattering. In videos, the dress styling detail above her bump can be seen better. Meghan looks glamorous and very pregnant, but the gown is not as flattering as the one designed for her by Clare Waight Keller for the British Fashion Awards ceremony. Out of curiosity - it seems maternity shirts/dresses have gone out of fashion? Both those things sound like so much fun! Put them back to back and you'd pretty much have my perfect day. No, I think the style of maternity fashion has just changed greatly to look more like regular clothes tailored for a growing abdomen as opposed to giant muu muus that hang over the bump. You actually think you know what they watch on television? Seriously? Given that it's been confirmed that the Queen watched season one of The Crown; I'm going to go with "they watch whatever they want just like the rest of us" and a healthy dose of "not my business" followed by "do we really have to worry about what they watch on television?". I don't follow the royals but watching ballet rehearsals and cuddling dogs sound like paradise to me! Prince Philip has been in a car crash but is unhurt. I hope that there are no consequences from the incident. Some articles are suggesting he may no longer be allowed to drive; whether self-enforced, by request of the Queen, or law enforcement. The road the Prince was turning onto has a speed limit of 60mph and has had several fatal car accidents in the past few years due to it being used as a 'rat run' according to one local. The locals have asked for speed cameras and a lowering of the speed limit which I guess will now happen. The fact that Prince Philips rather substantial Land Rover and possibly armoured car was knocked onto its side by a much smaller Kia does say the speed the Kia hit Prince Philips car was pretty fast. I'm not saying that driver was exceeding the speed limit but certainly going at the speed limit. Prince Philip probably misjudged the speed the other car was approaching at. This article shows both cars after the impact - Prince Philip was on the side that hit the floor - he was very lucky to be un-injured IMO and probably that was only due to the re-inforced nature of the car - a normal car would have had much more damage and could have proven fatal to the driver. ETA: Just been reported that there was a baby in the other car - thankfully unhurt from the reports I'm hearing! !